Bits and Pieces.. of a happy life - couldn't resist! I'm a quilter at heart...after seeing mollychicken's wonderful scrappy patchwork I just couldn't resist taking my scraps and seeing what would happen! So much more free-form that the traditional patchwork I'm used to.. I'm such a doofus. At first glance I thought it was a swimsuit top. Oh, I just finished a couple of aprons and I have scads of scraps from all manner of things. I may have to drop everything and see what I come up with. 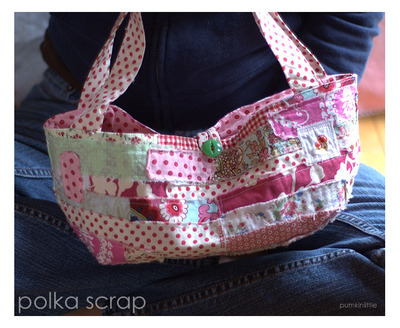 I love this very much ~ I'm a scrap lover! Oh my!! So so so cute!! Love it to bits!!! Oh my this is so wonderful. The colors and texture is fantastic.